Your business is a content business, even if it isn’t. And if it isn’t, then you soon won’t have a business. Tags: Content marketing, entrepreneurship, marketing, publishing, book marketing, event management, public speaking, video marketing, blogging. You want to learn about content marketing. You’re in charge of marketing for your business. You want to start a business, but you don’t want to fail, waste time, or waste money. A few years ago I read Epic Content Marketing by Joe Pulizzi and then subsequently read every other book I could find on content marketing, measuring them all against Epic. While other books added context, case studies, and tips here and there, Epic still stands as my definitive go-to book on content marketing. I recommend it to everyone I meet who asks how they can learn more about content marketing. But Joe isn’t just an author. His name is practically synonymous with content marketing as the founder of the Content Marketing Institute which is the go-to website on content marketing and the organizer of Content Marketing World, the largest gathering of content marketing experts in the world. 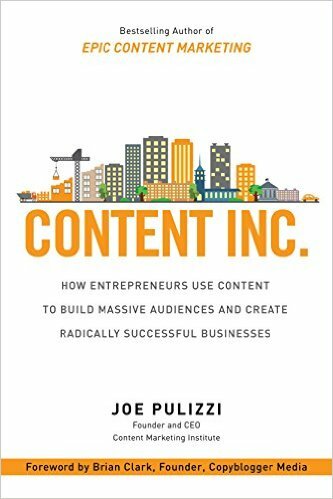 Now, Joe has released Content Inc. which builds on Epic to tell you how to create a content business to build your business. He walks readers through finding their “sweet spot,” or the intersection of your abilities and interests, discovering a way to “tilt” that sweet spot to identify where there isn’t any competition, building a platform for getting content out, attracting an audience, expanding into multiple channels to deliver content and grow the audience even more, and then how to monetize that audience so you can make money doing what you love while helping others. Do you need to read Epic first? No, not necessarily, but I do recommend you read both. They complement each other and they’re both enjoyable, interesting reads.